Winter got off to a pretty mild start all around North America, but seems to have arrived now, everywhere just in time for the new year. Finding birds in the winter can sometimes be very challenging. Birds are mainly concentrated wherever food is plentiful and there is good shelter. Some species such as finches are most active early in the day, but you should be able to find some species at any time of day. If there is any open water in the area, that’s a prime place to start looking for ducks, raptors, gulls, herons, shorebirds, and even kingfishers can be found around open patches of water or sewage treatment plants. When driving around the countryside or near airports, watch the open fields for Rough-legged Hawks, Northern Hawk Owls, or even a Snowy Owl. These species will often perch in trees, on telephone poles and also hay and straw bales. Snow Buntings and Horned Larks gather in large flocks which fly close to the ground in fields. Northern Shrikes are often found perched on the uppermost point of a tree in small clumps of bushes. 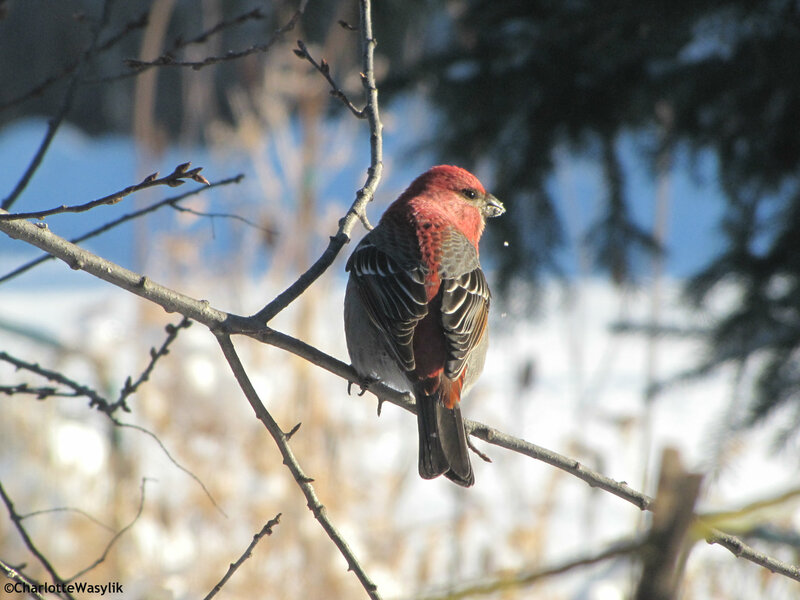 Winter finches are usually heard before they are seen — Crossbills, Pine Siskins, and Pine Grosbeaks are very vocal in the winter which makes them easy to locate — often feeding on pinecones at the top of spruce trees. The best way to locate certain species is to ask local birders about the best locations for wintering species in your area. eBird is also a fantastic resource for finding birds in your area. You can submit your own sightings to eBird — adding to the ever growing eBird database of checklists which helps other birders and scientists track bird distribution and abundance. When I have time in the winter, even in the bitter temperatures from around -20 to -40 degrees Celsius, I trudge through the snow in search of owls, woodpeckers, and winter finches. Staying warm in the frigid temperatures can be a challenge, but being comfortable makes birding much more enjoyable. 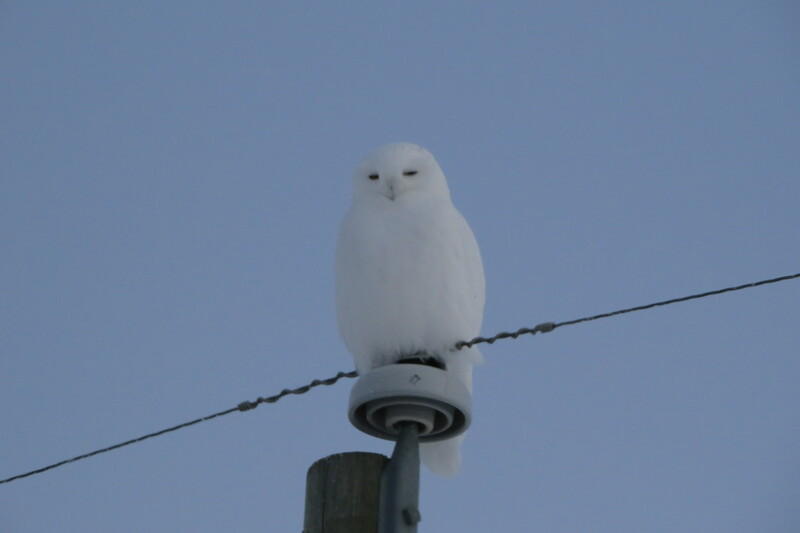 Sometimes the coldest days can produce the most spectacular birds, but nothing is more frustrating than watching a Snowy Owl and not being able to feel your toes! Using a camera can be a challenge on very cold days, because changing the dials with mittens or even gloves can be difficult. I try to have my settings ready before I leave the house to minimize fiddling around in the cold. Also, batteries lose a lot of power when exposed to low temperatures, so I keep spare ones warm in an inner pocket, close to the body. Layers upon layers are the key to staying warm outside. I like to wear warm sweaters and leggings. And on the outside — my snow boots (Baffin), waterproof snow pants, a waterproof winter jacket, my Punk Rock Apparel Snowy Owl winter hat, and a scarf or gaiter. Keeping your extremities warm is essential for winter birding. I like wool socks, and I dry my boot liners overnight. This way there’s no excess moisture in the liners. I wear leather mittens with finger liners since they are incredibly warm and easy to use with binoculars. Hand warmers can be useful since you can stick them in your mittens, pockets, and boots. Constantly moving also helps to keep you warm. Birding in Germany was a little different for me because the climate is so much more humid and damp than the prairies. The cold went straight through me, so I made sure to dress very warmly even through the winter temperature wasn’t much below zero. Birding by vehicle can make the weather a little more bearable. Dress as warmly as if you’re going for a walk, because any number of things could happen — a bird might be sitting in a spot where you have to go outside to get a good view, the heater in your vehicle quits working or have some other breakdown (my truck started leaking coolant and overheated far from home on the day of the Christmas Bird Count), or you get stuck in the snow and have to walk. If you can’t brave the cold, sit by your window with a book and something warm to drink and watch the birds at your feeders. Feeding birds in the winter gives you a chance to watch birds without having to go outside and provides extra sustenance for birds dealing with the winter weather. Many rare birds often show up at feeding stations, so keep an eye out for unusual birds at your feeders. Even if nothing rare shows up, watching the Black-capped Chickadees, Downy Woodpeckers, and winter finches at close range is always enjoyable. For more bird feeding tips, I highly recommend Myrna Pearman’s new book, Backyard Bird Feeding: An Alberta Guide. There are a number of citizen science programs that take place in the winter, including Project FeederWatch, Christmas Bird Counts, and the Great Backyard Bird Count. You can provide important information about the winter bird population in your area by counting birds at your feeders and reporting the results. Whether you’re walking, driving, or window-watching this winter, have fun and stay warm! 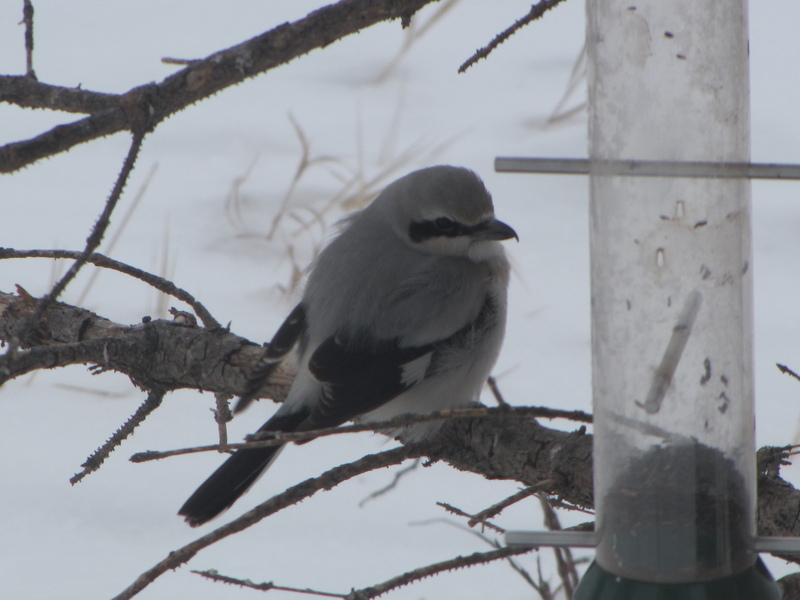 This entry was posted in Alberta Birds, Bird Identification, Birding, Canada Birds, Feeding Birds, General Birding, Nature, Winter and tagged Birding in the Winter, Birding Tips, Finding Birds in Winter, Northern Shrike, Pine Grosebeak, Snowy Owl, Winter Birding, Winter Photography. Bookmark the permalink. Yeah the winters in Germany are a bit different, though don´t be deceived, since when we have the icy and dry east winds instead of the humid and mild west winds the situation changes immediately. This winter is perhaps the best example for this: The December was exceptionally warm (up to 15 °C), but when the snow finally came in January instantly interesting birds turned up like Whooper Swans and Northern Bullfinches. Also three Common Cranes had been forced to rest on a lake nearby, even though these are rather uncommon here in Franconia. That was a wonderful bit of very useful information, I really enjoyed your photos.